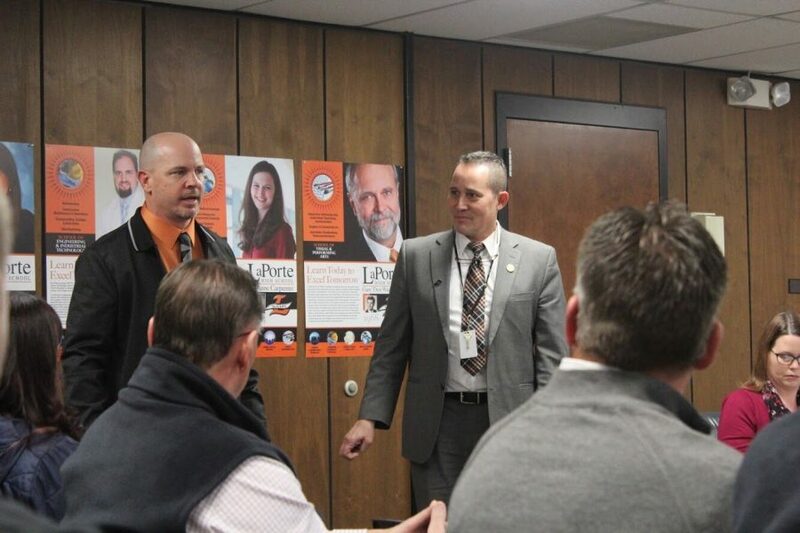 Jeremy Lowery was announced as the next head football coach of LaPorte High School on February 11th. The hiring came after former coach David Sharpe’s resignation due to personal reasons. Lowery comes from Paoli High School in Paoli, Indiana, where, as the offensive coordinator, he helped lead the Rams to a 13-1 overall record, with a 5-0 conference record, which was 1st overall in the Patoka Lake Conference. Despite his success at Paoli, Lowery saw a great opportunity here in LaPorte. Lowery runs a flexbone offense, a formation which uses a quarterback, five offensive lineman, three running backs, and varying numbers of tight ends and wide receivers. He has been running the offense for 12 years and will continue to use it here in LaPorte. Lowery wants the football program to be highly successful and one that builds a championship culture. “We want our program to be viewed as one with unity, competitive drive, and grit. We strive to give our school and community a winner,” Lowery said. As for next season, Lowery has already began preparing for the upcoming schedule. The team has started building relationships with one another as well as weight training, conditioning, and implementing the team’s offense, defense, and special teams. “I believe that our team must start with understanding our beliefs and culture,” Lowery said. Players have been excited about the energetic nature of Lowery and his coaching, and that passion is rubbing off on players. “He’s very high intensity in the weight room and he is very dedicated to this program,” Lewis said. Despite the fact that he has only in LaPorte for a couple of months, Lowery is already receiving praise from his fellow coaches. “He’s a very energetic guy, very knowledgeable, smart coach, and he’s just a fun guy to be around,” assistant football coach Bob James said. With this school year nearing a close, football season is just around the corner. Lowery wants fans and opponents alike to know one thing. “I want people to say, ‘Man, those guys play hard,’ and, ‘Wow, those kids love playing football.’” Lowery said.